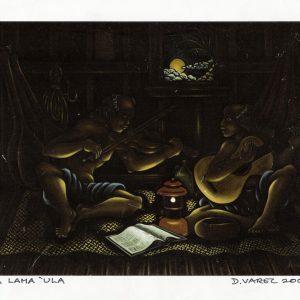 Pele and Hi’iaka is a timeless tale of passion, betrayal, healing and reconciliation. 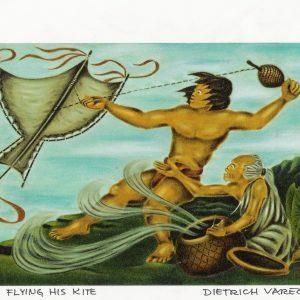 One of Hawaiian mythology’s greatest epics is freshly interpreted by Dietrich Varez, one of Hawai’i’s most celebrated artists. 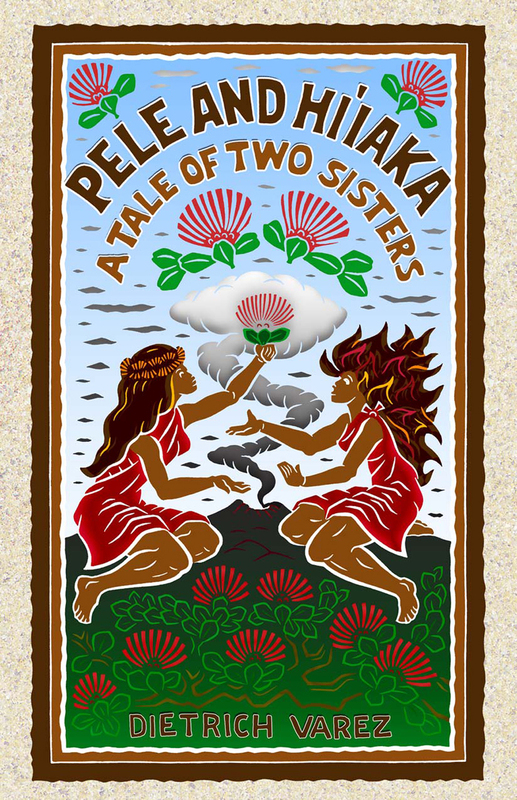 The story of Pele, goddess of Hawai’i’s volcanoes, and her youngest sister, Hi’iakaikapoliopele is retold and lavishly illustrated with the artist s iconic block prints. 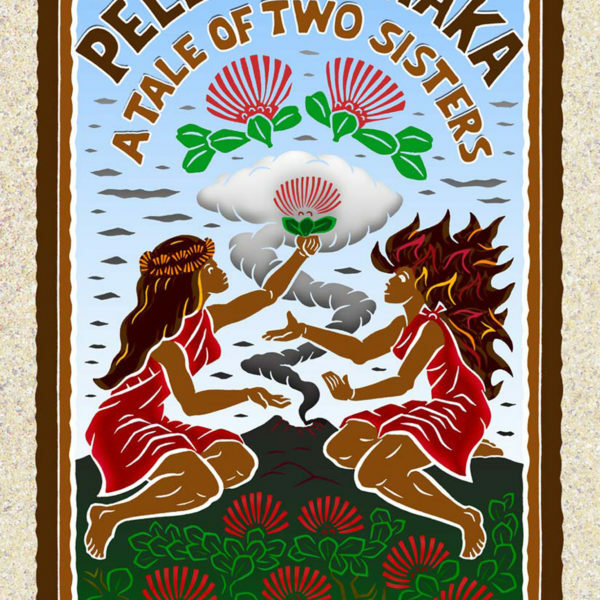 The sensitive visual interpretation and simplified text honor the rich mythology passed through Hawaiian oral tradition.This picture-book style presentation offers a fresh visual tribute to these enduring mythical figures with the turning of each page. After a quarrel with her sister, the sea goddess Namakaokaha’i, Pele fled her homeland of Kahiki accompanied by members of her family. She settled into the fiery lava pit of Kilauea, in the upland region of Hawai’i island. 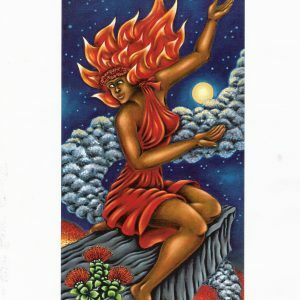 Deep in a dream, Pele, in her spirit form, followed the sounds of hula pahu drums. She arrived at Kaua’i and was immediately captivated by the handsome young chief, Lohi’au. When she awoke, Pele asked each of her sisters to go fetch her new lover. Hi’iaka agreed to undertake the perilous journey. 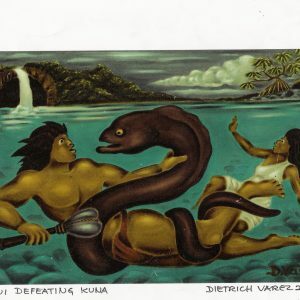 With her companions, Hi’iaka encountered many adventures on her travels throughout the Hawaiian islands battling reptilian mo’o and other evil creatures, helping people in need, making new friends and visiting old ones. Pele and Hi’iaka is ultimately a testament to the enduring power of love.